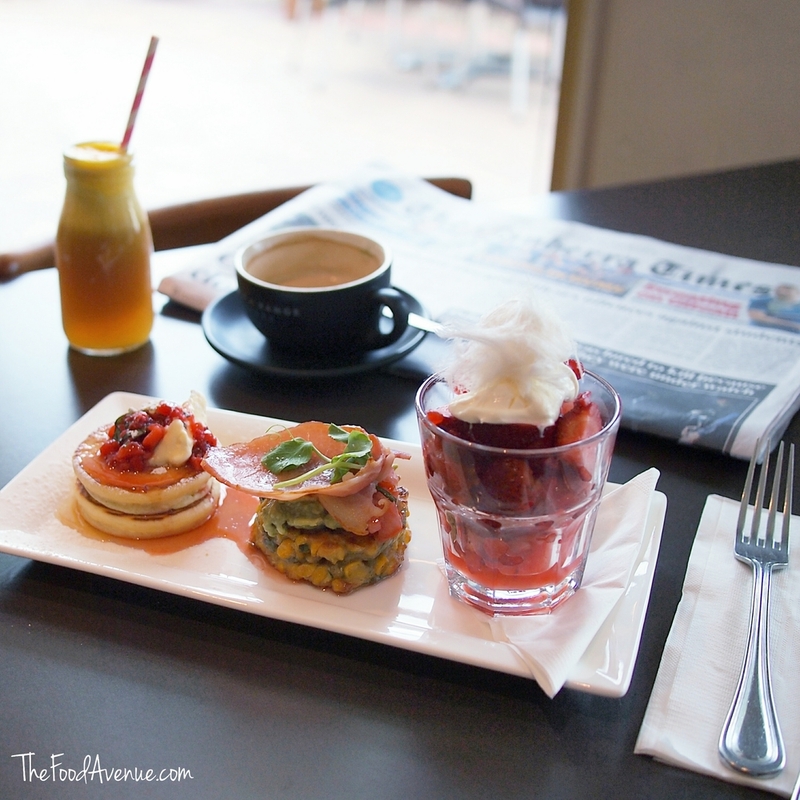 Trevs@Dickson is a Canberra cafe that offers visually spectacular food with personalised service. Owner Trevor McGrath has been a chef for 20 years and has even worked at the Prime Minister's official residence - The Lodge. Five years ago, Trev decided he wanted to branch out and do his own thing - so he opened Trevs@Dickson. Some friends and I were invited by Trev to come for breakfast and I was excited to find out what he had in store for us. His passion for food and his own business is evident. His enthusiasm and personable nature is shared by his team. The wait staff who took my coffee order was perfectly obliging when I asked if they did "Three quarter flat white coffees". She clarified whether I wanted three-quarter weak coffee and I was more than happy to explain that I meant it was three-quarters of the normal amount of milk. I liked that the attitude here wasn't just "No, we don't do that", the end. They sought out what I actually wanted in a friendly way, and delivered. Side note: Not many Canberra cafes seem to be familiar with the Three Quarter Flat White (also known as a "Magic"), which is ubiquitous in Melbourne. As well as fresh beans and good roasting technique, I believe a good coffee is enjoyed with the preferred amount of milk. It may be no milk (non milk-based espressos) or it may be quite a lot of milk (e.g. lattes). For me, there doesn't seem to be anything in between a normal flat white and a short or long black. So that's why I prefer to order 3/4 flat white coffees. I feel like Goldilocks when I get the perfect coffee - not too much milk and not too little, just right! Coffee how I like it, made to order. I decided on the spot I'd be back again soon and I hadn't even gotten to the food. The Trevs Taste Collective plate is great for solo diners or people who don't like to share their food but enjoy variety on their breakfast plate. The tasting plate means you don't have to choose between a sweet or savoury breakfast dish! A mini corn fritter stack with avocado and tomato, topped with bacon satisfies the need to start a meal with savoury flavours. The mini hotcake stack tantalises the tastebuds and delivers a sweet hit. I ate parts of the fritter and the hotcake at the same time (rather than one at a time) and loved how the different elements balanced out the meal. I liked finishing off with the two fruits salad of strawberry and watermelon with kaffir lime syrup topped with mascarpone and fairy floss! My favourite part of the meal, however, was the mini juice of the day. Today, it was a delicious blend of apple, orange and cranberry. I would come back just for this juice. At $18.50 for the plate and the mini juice, I consider this great value. You would be hard pressed to find a better value breakfast in Canberra with this much variety on one plate. Breakfast is available 7 days until 11:30am. Trevs also offers lunch and dinner as well. Look out for special events. I had dinner at Trevs during the Truffle Festival last winter and had a superb steak. I dined as a guest of Trevs for breakfast on 9 October 2015 but all views are my own. Are you on social media? Don’t miss snackable information about my flavour journey! You never know what hidden gem might be just around the corner from you! Do you know of other places that serve 3/4 flat whites? If so, let me know in the comments below! I'd love to hear from you!